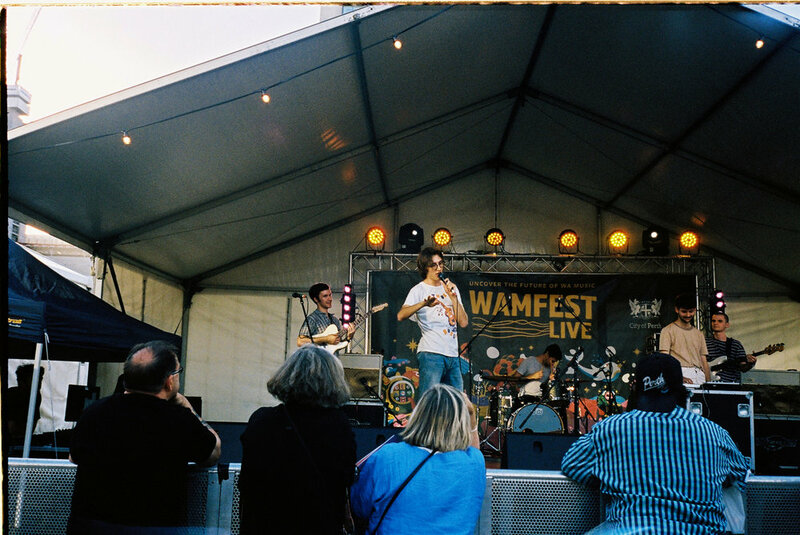 Now in its 25th year, WAMFest returned to showcase WA’s homegrown talent. I was there on Saturday, day two of the three-day festival as 142 acts were poised to perform, spread across 17 stages and 15 venues. The Bird, Nevermind Small Club, Paper Mountain, Badlands (including the temporarily-reopened Henhouse Live) – all the usual haunts plus many more. Most interestingly, Yagan Square was finally set to be utilised, hosting a dual stage ‘Lot Party’ area reminiscent of a music festival; pop-up bar, grassy areas and all. With all the constant redevelopment projects, Perth has always felt like a bit of a work in progress. This was most apparent as we trekked through Perth Cultural Centre on the way to The Court or Badlands and noticed the gargantuan, iron-clad scaffold which had apparated around the old museum. It looked - in the words of senior editor Howie - like a “political promise gone wrong.”. There was a lot of promise in the air that day as made our way to the opening of WAMFest. I hoped, for the sake of the Perth music scene, that it would not go wrong. At midday, the festival simultaneously kicked off at Yagan Square, the Cultural Centre and Nevermind Small Club. It was just before this, as I flicked through a program at Nevermind while waiting for Butter to take the stage, that it hit me. Traversing this festival was going to be a challenge. 142 acts. 17 stages. 15 venues spanning northward to Nevermind, southbound to Wesley Church and as far east as Badlands. And only 12 hours to see it all. Hard decisions would have to be made about where to go and who to see. Clashes of the most-anticipated groups seemed to run rampant throughout the program. From Henhouse to The Bird and then back to Lot Party, as soon as one set ended, there would a mad dash to the next venue. With tight, 30-minute set times, WAMFest seemed determined to pack an impossible amount of music into the day. But I didn’t want to miss a moment of it. Setting logistics aside for a second, every act I was able to catch at this festival was a reminder just how lucky we are in this city to be gifted with such awesome talents. My opening act of choice, Butter, delivered a noticeably smoother performance than when I saw them last, back at Badlands in September. They seemed more relaxed, in their element, even, amidst the cosy outdoor area of Nevermind Small Club. As they delivered their solid performance, Simpsons samples and all, the venue seemed to complement their chilled out, grimy soul. Later, I glimpsed Didion’s Bible at Lot Party, where the dichotomy between the two lead guitarists/vocalists alternating roles from the left-hand side of the stage was quite a sight. While the rest of the band delivered confidently and modestly from the right, the two leads traded off bouts of shouting, rolling and dropping their picks. Unleashing their story-like ’25 words or less’ lyricism with explosive energy that outpaced even the most dedicated heckler, Didion’s Bible took us to church. In fact, their captivating physical, vocal and instrumental performances showcased just what Lot Party and, by extension, Yagan Square was capable of as a hub for arts, culture and performance. Throughout the evening and into the late hours, the square bustled with the normal night crowd and club-goers, but there was a slightly more family-friendly atmosphere than usual. Even past the watershed, it remained relaxed and tranquil as the pedestrian traffic mixed in with the Perth Glory crowd (clashes being a recurring theme of this event). It felt like Yagan Square was finally achieving its goal of becoming a focal point for the city. As the night went on, the crowds within Lot Party only grew, the Perth night life acting as a multiplier as the loud noises and bright lights emanating from the FREE ENTRY venue attracted bar hoppers like moths. Brother/sister, DJ/rapper duo, Hyclass dropped verses on them hot enough to make Butter melt and the large stage complimented the loud, electronic-driven pop noises of Priscilla, who sent bass shockwaves and glorious hooks out to catch the ears of patrons at the overlooking rooftop bars. Towards the end of the night, it took some strategic planning to coordinate splitting our time between seeing Demon Days back at the Lot Party and Pot Plant House Party at the Hen House Live. A brisk, 10-minute walk to Henhouse was required to enjoy PPHP’s grungy, thrashy bangers as they reproduced the unexperienced nostalgia of the 90’s American teenage grunge phenomenon, evoking Nirvana in the intimate side room of Hen House Live. Then with more than enough spring in my step to get me back to Yagan Square, I found myself energised enough to truly notice the shift in in the air there. It was a far cry from what I had felt when I saw last Demon Days at Badlands, all the way back in September. Now, there were no mounted police units or distant yelling to be heard, just the jolly, drunken laughter of Perth’s music fans as they took over the streets to the sounds of Demon Days and The Money War, who closed out the night in spectacular fashion and perfectly sent off the 25th WAMFest. Yagan Square was the highlight of my WAMFest. It was also, I think, the catalyst for the strong attendance of this year’s event. Born of a 10-year-old proposition, the square has delivered on that decade of promise. It’s a space that, utilised in a festival setting, has a pleasant and natural atmosphere. I never felt the need to check over my shoulder. Not because of any copious police presence but because I simply felt safe there, amidst a large number of people from many different walks of life. It was a pleasure to be able to mill about Northbridge and the square freely, enjoying a beer, band and the beautiful weather. It’s this kind of relaxed atmosphere that is the perfect stage for Perth’s prolific music scene. Let’s just hope they don’t knock the whole dang city over by 2019, because I know that myself and all of the festival’s 142 groups are looking forward to what next year’s WAMFest has in store. I’m looking at you, Mark McGowan.